Workshop: "The Healing Power of Music in Palliative Care"
“Tossed Salad” on KPTZ, with host Phil Andrus. Workshop: "Here's to the Women"
Benefit for the Bellingham Food Bank! Saturday, April 13th, 7:00 PM. 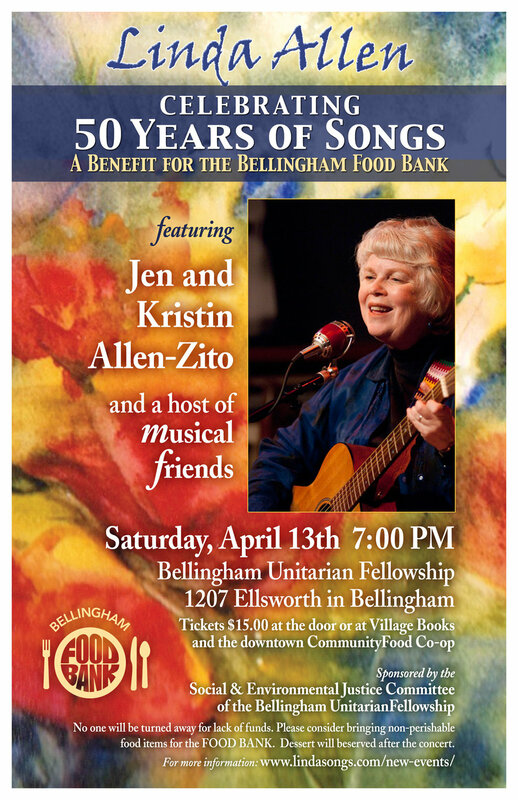 On Saturday, April 13th, the Social & Environmental Justice Committee of the Bellingham Unitarian Fellowship will sponsor songwriter Linda Allen, daughters Jen and Kristin Allen-Zito, and a host of special musical friends in a concert in celebration of Linda’s arriving at the half century mark as a working musician. In addition to an evening of wonderful music, every dime after expenses will benefit the Bellingham Food Bank. The concert will be held at the Bellingham Unitarian Church, 1207 Ellsworth in Bellingham. Tickets are a suggested donation of $15.00 and are available at the door. No one will be turned away for lack of funds. Please consider bringing non-perishable food items for the Food Bank. Dessert will be served after the concert. Linda has been a working musician beginning in 1969, writing and singing powerful songs of hope and history, spirituality and death, love and whimsy in a style the writer Studs Terkel once referred to as “true and delightful”. In this concert, she will be celebrating the release of her eleventh and twelfth recordings as well as sharing a retrospective of her life’s work…so far. Linda’s special guests, in addition to daughters Jen and Kristin, to date include Janet Stecher and Susan Lewis (Rebel Voices), Phil Heaven, Jeff Wilson, Tom Rawson, Jan Peters, Laura Smith, Kitty King, Marie Eaton, Meryle Korn, Women With Wings, Ellen van der Hoeven, and Scott Slaba. at Portland FolkMusic Society's annual retreat. In recognition of National Women’s History Month, Linda will be lending her voice to the YWCA’s presentation of, Heartsongs, A "Her”storical Perspective. Participants will learn about women's history through music and hands-on activities. Women’s contributions, cultural similarities, challenges, and the need for continuing cooperation among women’s organizations will all be discussed. The event will be held in the YWCA’s ballroom, 1026 North Forest St. Bring your own brown bag lunch and beverage (alcohol-free). Pre-registration is required to assure adequate seating. To register, please email katie@ywcabellingham.org. Donations will be gratefully accepted.